At home in Cimmeria, Conan feels a confidence he hasn’t experienced in some time. However, Bêlit is unsure of herself among Conan’s family and clan in this strange, frozen land, a dangerous variable as the two face not only the impostor Conan, but also his vicious army! 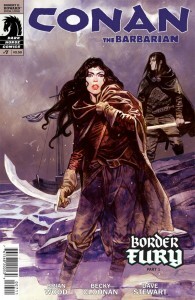 Conan and Belit are still tracking the imposter throughout the harsh lands of Cimmeria, writer Brian Wood continues telling this adventure in story in narrative form with internal/interior monologues. In the beginning of this Issue its apparent that Belit is struggling keeping up with Conan, the land of Cimmeria is slowly over whiling the Queen of the Black Coast. After a brief encounter with a warrior who was sent to confront Conan, later that night they have a conversation that concludes with both agreeing Conan should continue tracking the mystery man alone. 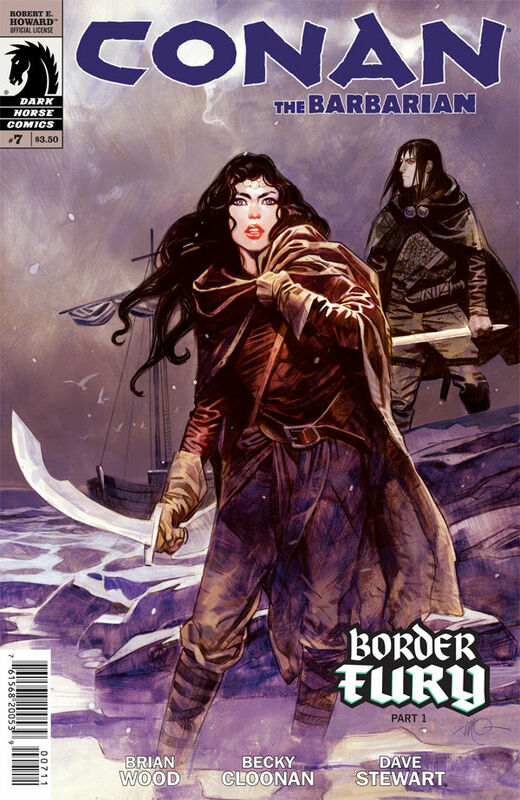 Now on her own in the cold mountains of cimmeria, Belit faces the dangers of the land and its occupants and must use her love for Conan as strength to it out alive. Meanwhile Conan tracks the imposter and his crew of savages to what looks like a giant glacier , with sword in hand the Cimmerian angrily shouts for them to face him. In the end Border Fury had the potential to turn into a good story for the Conan series but sadly it looks like that’s not going to happened sometimes when comics have multiple story arcs a lot of things get disregard like character development or in this case a quick story conclusion’s, Border Fury would be a lot better if it had at least 6 issues just enough for writer Brian Wood to time to elaborate on how much damage the unknown warrior has caused in Cimmeria with that said I think the story was a little too fast for me to enjoy. Artist Vasilis Lolos takes over for Becky Cloonan and will admit that I don’t particularly care for it, his style is unique and I don’t mean that in a good way. At times I couldn’t tell the difference between Conan and Belit due to them being drawing so similar, Lolos art is a little to grungy for me. Final Thoughts: Border Fury Part#1 is filled with narrative dialog’s, something I’ve noticed a lot from writer Brian Wood. Wood likes to script his tales in third person omniscient narration and in my opinion this format works for all of Conan’s adventures. It gives you sense that Wood himself is telling the tale and guiding the reader. 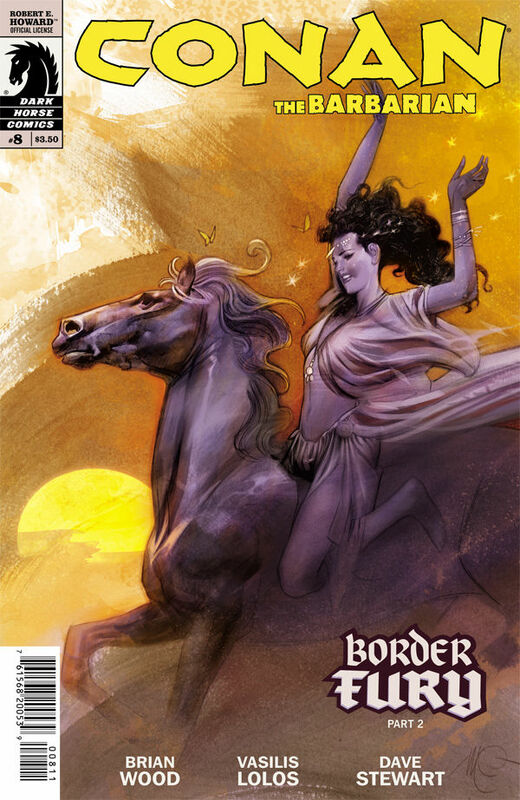 One main focus for this issue is Belit, it seems the Queen of the Black coast is having a hard time adjusting to the non-piracy life and its quickly taking a toll on her mentally. Like Conan in the Argos Deception and Queen of the Black Coast adventures she is struggling emotionally. Wood is doing a role reversal with the two in Border Fury tale, which has sparked my interest greatly, I am waiting to see how this adventure unfolds and if Belit can keep it together. Artist Becky Cloonan is brought back and she brings a significantly darker and unique art style to this new tale.